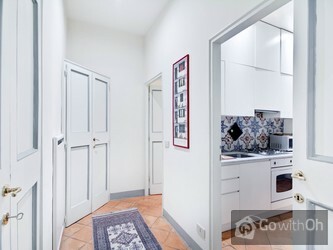 This beautiful 120m2 apartment can comfortably sleep up to 8 people and is located on the first floor (without a lift) of a beautiful building in the heart of the eternal city. 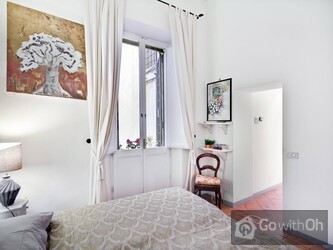 It is the very centre of Rome in a small street opposite the Piazza della Chiesa Nuova en Corso Vittorio Emanuele, very near to Piazza Navona and Via Giulia, one of the most beautiful streets in Rome. 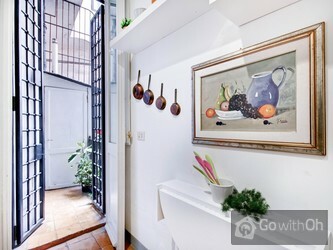 The apartment is very comfortable and refined, and is located in the area of the former Roman craft workshops and the main district for night life. 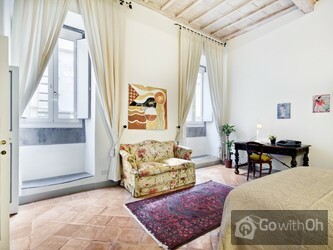 It is the ideal accommodation choice for those looking for an exclusive, noble-style atmosphere; the apartment offers a very private atmosphere and has a location that allows guests to enjoy visiting the most popular tourist archeological sites of interest quickly and easily. This beautiful apartment has been carefully and tastefully decorated and includes a large lounge with two comfortable double sofa beds, a large table with chairs for meal times, and a flat-screen television for moments to relax. 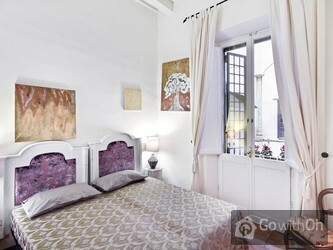 Both bedroom are doubles (one has two single beds that can be divided or joined depending on need), and large windows that lend wonderful light to the accommodation. 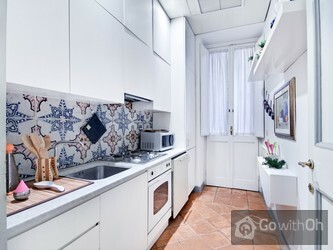 The modern kitchen is fully-equipped with all mod-cons that guests might need during their stay. 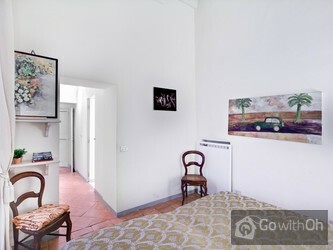 The two bathrooms are tastefully decorated and have a bath (one with hydro-massage system). 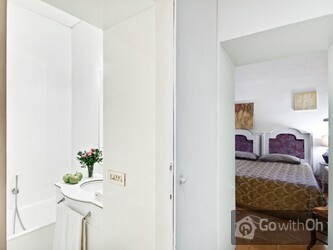 There is also air conditioning and internet connection throughout the apartment. Cot and high chair available on request at no extra cost. Please confirm availability directly with the owner before arrival, otherwise it cannot be guaranteed. 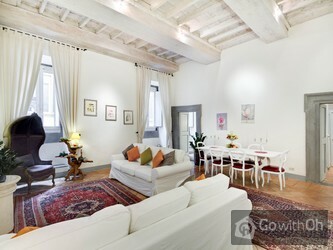 The apartment is very beautiful and the location is perfect!! The owners were helpful, too. Es una casa preciosa, muy cómoda y muy limpia. La chica nos espero a la hora indicada e incluso el ultimo dia que entraban nuevos inquilinos pudimos dejar las maletas sin ningún problema.. El apartamento esta muy bien sitiado yo diría que en la mejor zona posible, no cogimos el metro ni ningún ...otro transporte ningún dia. Vaticano a 10 minutos, coliseo 20 minutos, plaza navona 2 minutos... Le doy un 10. Nous avons été très bien accueilli, le propriétaire était très présent et sympathique, l'appartement propre mais il y avait un peu de bruit le weekend car il y a un bar en dessous mais pas trop non plus! El apartamento esta fenomenal y muy bien situado. Hemos estado muy agusto y las personas que nos han atendido muy amables. Muy cómodo, básico el aire acondicionado que disponía para el calor que hacia en Roma. Algún pequeño desperfecto que se podría subsanar en la casa, pero nada importante. MUY recomendable. buenísima idea el tener 2 teléfonos móviles para un uso moderado o emergencia dentro del alojamiento. El trato fue exquisito. La ubicación es inmejorable, por zona y transportes. Muy espacioso y agradable. Bien equipado. The apartment is beautiful and confortable. They even left us some fresh fruit and champagne. 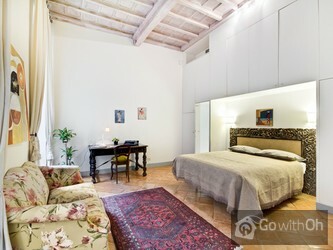 The contact person answers the emails very fast and the woman who showed us the apartment was nice and lovely. 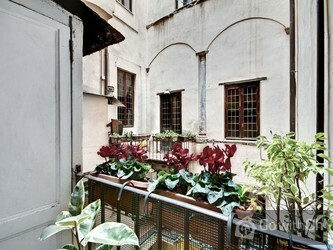 It's well located, half a block away from Corso Vittorio Emmanuel II and 10 blocks away from ...Vatican city. There is a supermarket a block away and a taxi stop two blocks away. It's fully equiped, and everything worked perfectly. The beds are confortable and everything was clean. The only thing I would have to say about the building (not the apartment it self) is that the stairs are old and it would be kind of dangerous for someone with young children or older people. And it's kind of hard climbing up the stairs with all the luggage but it's just for one day. 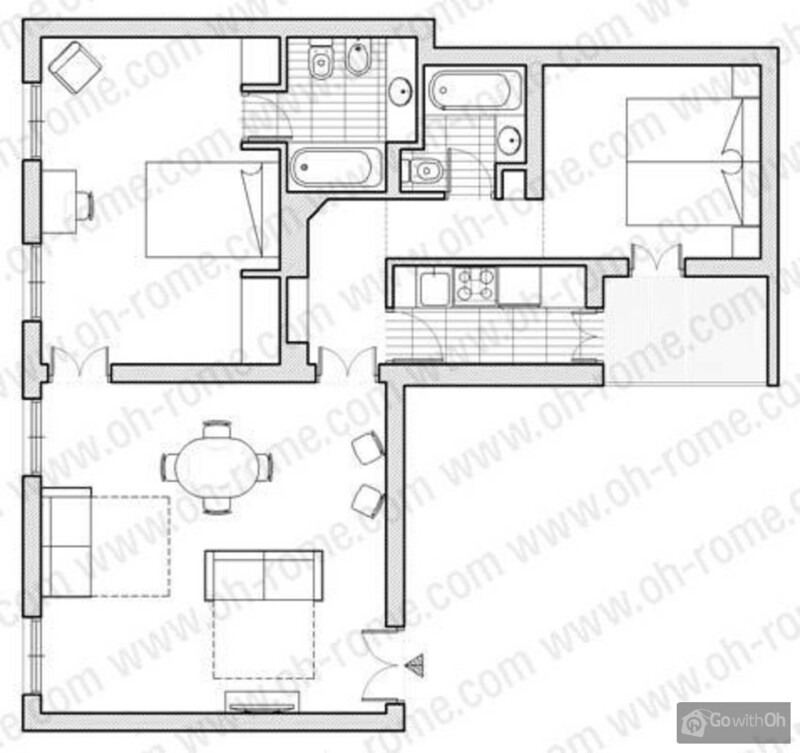 The apartment was spacious, clean and had a lot of character. The mix of vintage decor, pop art and antique furniture gave it real personality and the location was fantastic, you could literally walk to all the main sites within 15-20 minutes. 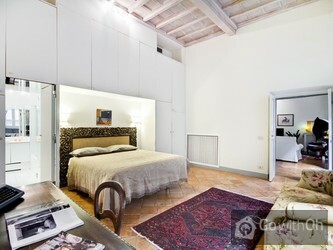 There is a great pizza restaurant and gelateria just ...around the corner, as well as 2 handy supermarkets nearby. We had a lovely warm welcome from V (including a beautiful display of fresh fruit!) she explained everything we needed to know and was available to answer any queries that arose. 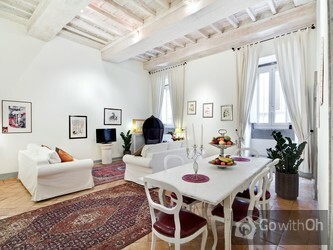 The apartment is in a fantastic location. We could walk to many places or take a choice of buses if we wanted. We were very warmly greeted on arrival.The apartment is not luxurious but all necessities are provided. There were 4 of us and it is very spacious. The air-conditioning worked very well on hot days. Highly recommended. Vraiment très bien, merci à K. pour son formidable accueil.